A cyclist navigates an obstructed bike lane on the 1900 block of Fairmount Avenue in Philadelphia. Cyclists are publicly calling out drivers who park in bike lanes more often these days, and a street with a tendency for loitering Wawa customers has been no exception. 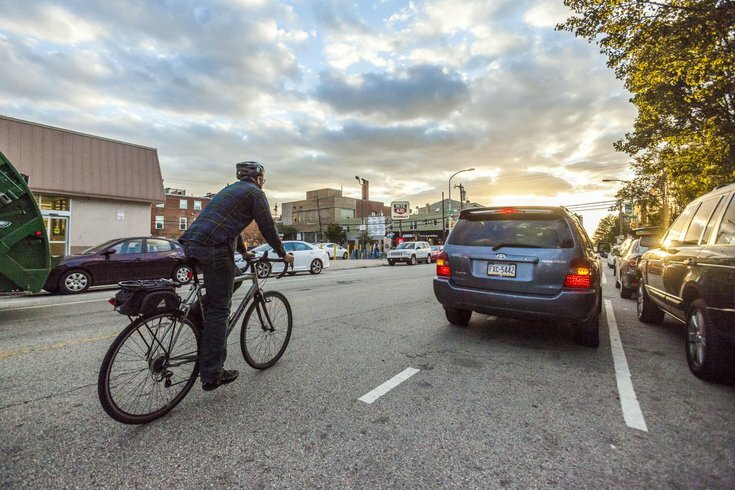 In a recent blog post on the Bicycle Coalition of Greater Philadelphia's website, shoppers at a Wawa — which just opened this past April at 22nd and South streets — have been called out for parking in the 22nd Street bike lane after a cyclist was hit on Monday. The coalition called the bike lane, which runs north on 22nd Street parallel to the Wawa, a "deteriorating" lane because of how many cars park there — even if just for a few minutes to run into the convenience store for a cup of coffee. Parking in a bike lane has been touted by activists in recent months as an extremely dangerous, seemingly harmless, parking habit. It often leads to bikers swerving into oncoming traffic, getting hit by car door swinging open or cars unknowingly hitting cyclists while trying to get in or out of the lane. The cyclist who was hit was not injured, but filed a police report and wrote a letter to the company, calling for more enforcement to keep the lane clear. The coalition published an excerpt of the letter on its website. "When your store opened, almost everyday (I take this route 5 days a week), there are cars pulled into the bike lane in front of your store. Some of these cars are delivery trucks, some are typical motorists, maybe stopping at your store, or maybe just taking advantage of a convenient spot to stop in a traffic lane. On Monday … I saw two vehicles parked in the bike lane, so I anticipated biking north on 22nd Street in the car lane on the right, and cars ready to drive north on 22nd Street still had the open car lane on the left. I biked through the South Street intersection, and continued biking north on 22nd Street, biking in a bright pink helmet — very visible. I passed the first car parked in the bike lane, and was about to pass the second car parked in the bike lane, when an SUV, driving in the lane on my left, cut across in front of me, maybe to pull in the alley, maybe to park in the lane as well, and hit me and my bike on my front tire, pushing me into the parked car, making me lose my balance, and have no point of exit in front of me, as the two cars created no space for me to go forward. I dismounted my bike and brought it up on the sidewalk. According to the same letter, the cyclist had to repair a bent front wheel. The coalition said the 22nd Street lane was reported 23 times in May on the Twitter account @ThatsABikeLane, where bikers can call out bike lanes that are repeatedly (and dangerously) obstructed by delivery vehicles, trucks and cars. "We have been in contact with the victim, and a lawyer, and are continuing to monitor and advise the situation," BCGP wrote. "We hope some good can come out of this and Wawa and the city takes more responsibility for this regularly-abused bike lane." Wawa did not immediately respond to a request for comment.